Pockets! What a lovely fur vest. Yes, it is quite bulky, but it has POCKETS! Pockets solve all decision making problems for me. 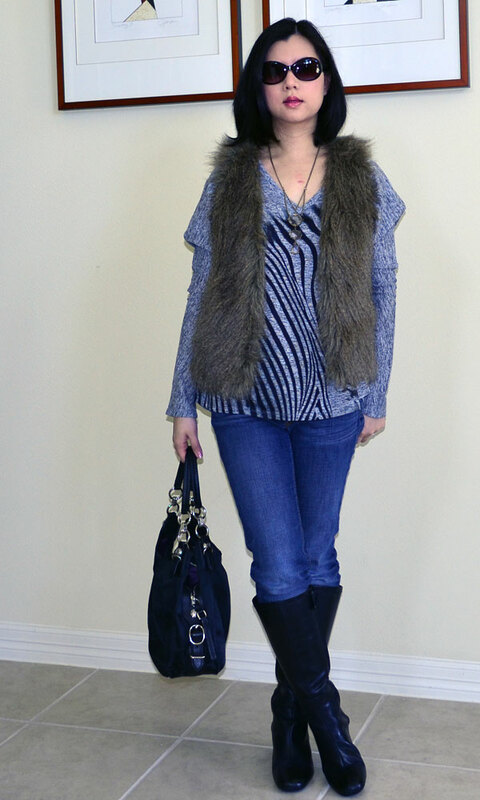 The fur vest wasn’t as soft as I would have liked but I love the length, the color and it has pockets. I purchased the Zebra sweater from shopbop.com during the Black Friday sale. I love the loungy feel and the material. However the size is humongous for a Small. I should have sized down yet the sleeves are pretty tight on me at a Small. This sweater features dolman sleeves which I always confuse with bat sleeves. Is there a difference? The shoulders of this sweater doesn’t appear at my shoulder but midway to my elbow. This creates a dropped effect like it’s too big for the body frame. It’s growing on me. It puffs up the sleeves and makes a cool visual effect on a print sweater. On another note, my boots from Rockport are COMFY! Its soles have the cushioned sole technology to support the feet from being fatigued. However, another post pregnancy FAIL happened. I purchased a size 7.5 since my feet has gotten bigger. Well Rockport runs large. When I walk, I feel like I’m about to trip 50% of the time. So if you’re interested in Rockport boots, size down.